JAMMU, Dec 12: Hindi Kashmiri Sangam organised an international Seminar at Chennai. Keshri Nath Tripathi , Governor of West Bengal was the chief guest on the occasion. Governor of Tripura, Kaptan Singh Solanki on the occasion released Keshri Nath Tripathi’s poetry book translated in Kashmiri language. A seminar on topic “A Hindi Sahityakaro ka Hindi Sahitya Mai Yogdaan & Hindi aur Rozgar ke awsar’’was also held on the occasion. Dr Beena Budki, secretary of Hindi Kashmiri Sangam who was the main organizer of the seminar read the welcome address. 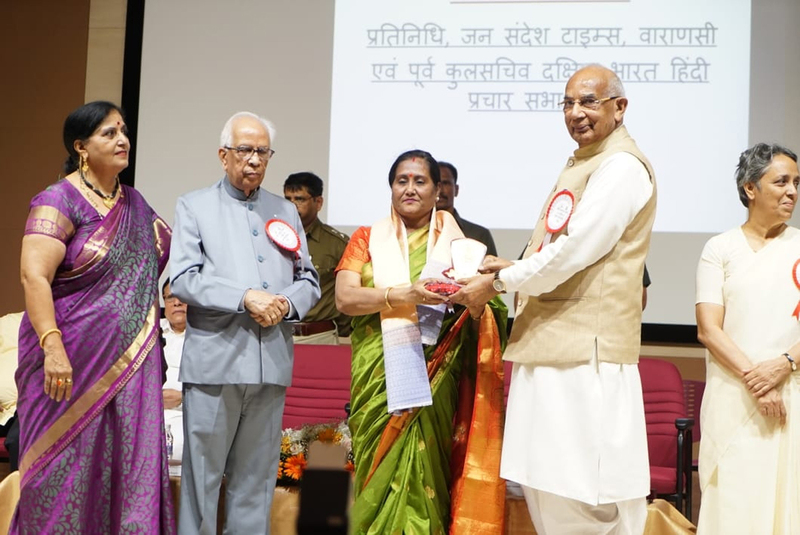 “Maa Bachao Pariwar Bachao” award was given to Mrs K Durani by Governor of Tripura, Kaptan Singh Solanki. Stella Mauris journal, Kashmir Sandesh and Dhumil ka Kavya Samagra and another three books were also released on the occasion. Nine cash awards were given to eminent scholars. They included Shridhar Paradkar Gwalior, Dr Gurinder Gill from Maleshiya, Dr Minhajuddin Ajmali Balia, Dr Pawan Kumar Ludhiyana, Prof Nirmala S Mourya, Chennai, Miss Anjali Patel Kathmandu, Dr Vinod Taneja, Amritsar, Dr Krishna ,Dr Beena Budki from J&K. On the occasion 45 scholars were also honoured.